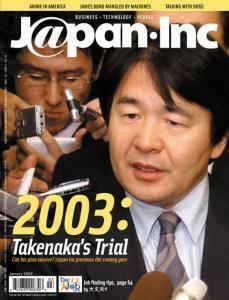 On the cover: Financial services minister Heizo Takenaka answers questions from reporters. -Government worried about foreitn Exodus from stock market. Japan still trails the US, Europe and South Korea in the field of terrestrial digital broadcasts. The new WiLL CYPHA makes Internet technology standard equipment. One university vies for students by arming them with laptops and loads of free Internet connections. Learning to understand Fido with Takara's dog translator, Bowlingual. TV fans turn to broadband and P2P applications to find their favorite shows. Japan's animated movies have risen from cult status to cultural force in the US. Now the moviemakers are out to win approval from Mom and Dad. A host of writers and analysts peer into their crystal balls with us and make predictions about everything from Takenaka's remedy for economic revitalization to medical care in 2003. When the Koizumi people told us they could revive Japan's economy by privatizing the Highway Corporation or the post offices, we knew they were into rearranging Titanic deckchairs. The economy is likely to shrink for the third year in a row on a calendar year basis, and the unemployment rate will start to rise again. "They have no awareness of the problem, and our society can't go on like that. The economy will get worse, but it serves us right." Corporate Japan is at a bifurcation point regarding its use of the Web. Not "approaching," but "at." Dr. Oh No! The name is Bomb. James Bomb. Suffering scribe Mark Schreiber frees the world's favorite secret agent from the horrible clutches of translation software. So Much for "Buy and Hold"
Discard that "buy and hold" logic or the bears will eat you alive, warns analyst Darrel Whitten. Favorite athletes, how to apologize properly, moonlighting and lots of mineral water.